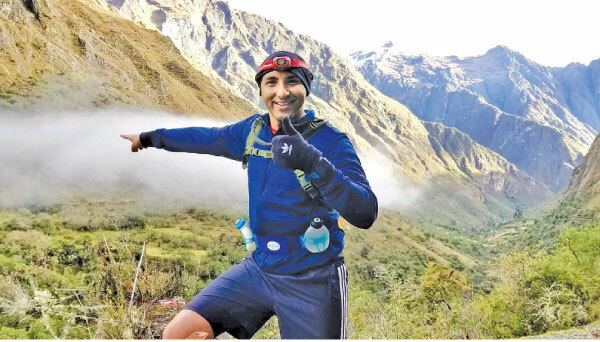 Sri Lankan marathoner, Hassan Esufally who is on a mission to earn the Seven Continents Marathon Club Membership recently ran his first-ever marathon in South America - a gruelling 42km trail across the southern Peruvian Andes. On his challenging journey towards becoming a 7 Continents Marathon Club Member, Hassan has now completed marathons in Europe, Asia, Australia, Africa and South America. 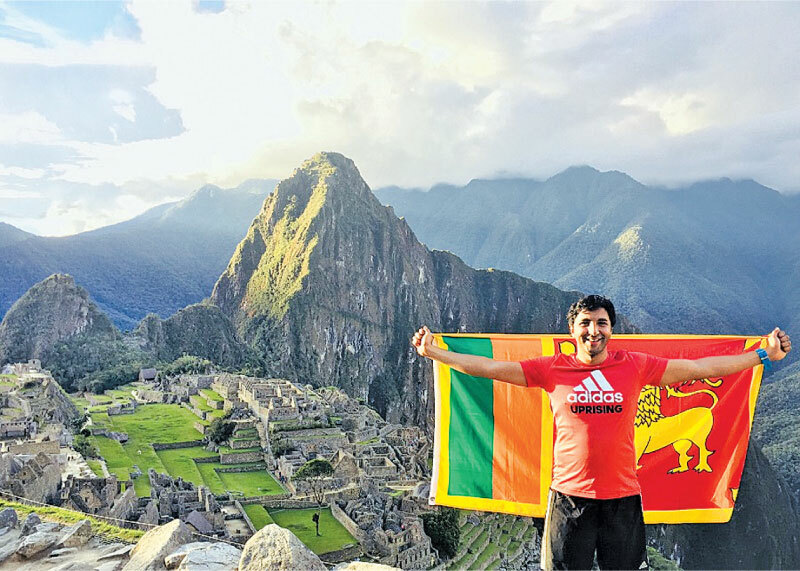 Running the ‘Inca Trail Marathon’ in Peru he becomes the first Sri Lankan to have conquered international marathons in five continents. “We started the race in total darkness, way before the crack of dawn, with only our headlamps to light the way. This was quite challenging for me given that I’d never run with a headlamp before, but I knew that this was only a foretaste of how much I’d have to push myself beyond my comfort zone during this marathon. In addition to making our way in the rugged and craggy terrain, we were faced with the most extreme and varying weather conditions, ranging from harsh winds and snow to heavy rains and sunshine,” he shared his experience. “The entire first half of the marathon was full of varying degrees of uphill and downhill slopes, so I adapted a strategy of walking through the uphill areas and sprinting through the downhill areas as I am a much better downhill runner than an uphill runner,” he added. Esufally said one of the most predictable challenges of this marathon was the extremely low air pressure which made breathing very difficult. “However, having trained intensely for many months with my high-altitude mask on, I was well-acclimated to withstand the acutely thin air atop the Andes. Moreover, by the halfway point of the marathon, I had twisted my ankles for a grand total of ten times, five times on each leg. By this time, my legs and entire body were so sore, but in spite of it all, I summoned up all the strength and stamina in me to race against time and make the cut-off for the WinayWayna Gate,” he explained. He pointed out that it was really encouraging to see how the hikers and holidaymakers on the Inca Trail were very respectful and thoughtful towards the marathon runners, always giving preference on the course. 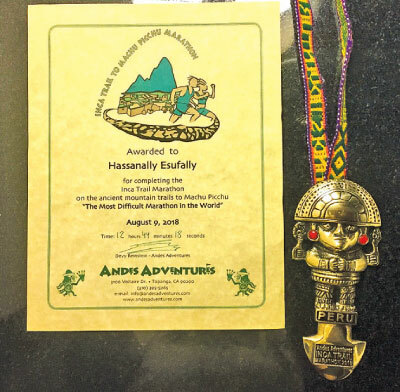 “My most memorable moments and experiences from the ‘Inca Trail Marathon’, I’d have to say, were when I first entered through the Sun Gate and set eyes on the mighty Machu Picchu fortress - it was profoundly relieving and rewarding to be standing up there, soaking up the beauty and glory of this lost ancient city,” he said. “On a personal level, the ‘Inca Trail Marathon’ was more than just a race - it was a one-of-a-kind, life-changing experience. I count myself extremely lucky and blessed to have had the chance to see first-hand and run atop this magnificent citadel. Running past the finish line of what is considered to be the world’s toughest marathon, with the Sri Lankan flag hoisted high above my shoulders is a moment that will forever stay ingrained in my heart and mind. The average person would take three nights and four days to complete a marathon of this nature. To have finished it in just 12.75 hours gave me a profound boost of confidence, and it made me realize that I have truly grown and improved as a professional marathon runner,” Esufally revealed.